Thread: Anyone have experience with Lume Cube for night long Exp lighting? I hadn't heard of these things before so I looked them up on B&H. There are some detailed reviews there which should help with some of your questions. I'm not entirely sure what you are looking to accomplish with the illumination... are the subjects near, or far away? For my own night photography, I haven't had to use a very bright light to accomplish any illumination needs. Usually you are operating at a fairly high ISO, and a quick bit of 'painting' with a regular headlamp can often do the trick. As an example, in my photo below I used a very low-power headlamp equipped with a red filter. 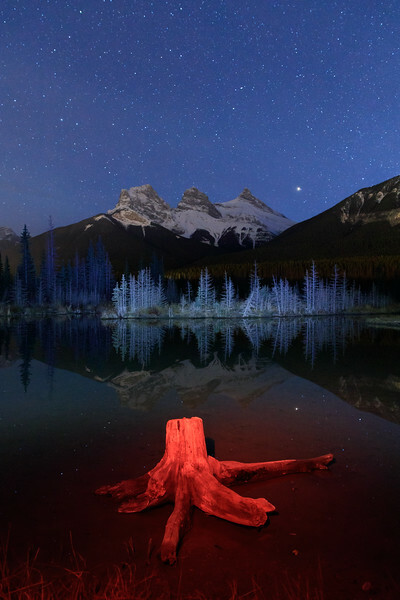 I shone the red light on the tree stump for a few seconds, then quickly lifted the filter and shone the white light on the trees in the background for the rest of the exposure. The exposure is 15 seconds at f/4, ISO 3200. Normally I shoot with a wider aperture, but I wanted more depth of field here so I opted for f/4. A more 'normal' exposure would be f/2.8 and ISO 1600. But that's with a moonless night. Adding moonlight to the scene would of course change things a lot. Thanks for your reply and example. That is very similar to what I am thinking and my post should have read 'starlit' , not moon as I am considering it for new moon times. The fact that the lumen output is variable was a plus for me. I thought your shot was pretty amazing for f/4, I would have guessed at least 8. Thats amazing! I love the area you live in, I have a good friend in Banff and I should visit her and shoot! I do already have a headlamp with a white or red lamp, I'll give that a go before shelling out. Your home of Utah is quite spectacular too! I've been wanting to spend time there myself. 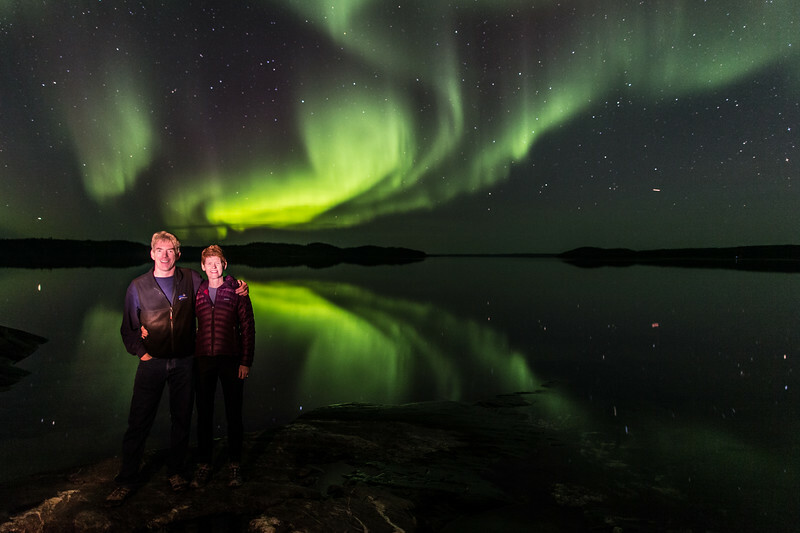 The aurora shot was taken up north in Yellowknife, where nights like this are pretty typical. If you're coming to Banff, let me know and I'll give you tips on where to go.